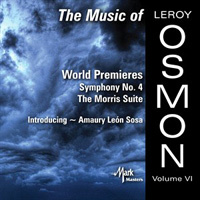 Description: Leroy Osmon is another of the prolific composers of meticulously crafted, highly accessible music for wind ensembles that this country excels at producing. He shares this volume of the ongoing series of his music with one of his students, who shares a similar aesthetic with his teacher. The ensembles for which these works were written are a large and virtuoso percussion ensemble and a group of tubas and euphonia, which guarantees a splendidly rich sonority throughout. Osmon's symphony is in the customary four movements, satisfyingly rhythmic, whether fast (first and third movements) or slow (the solemn, though not necessarily entirely serious, march that occupies most of the second movement). The composer uses a number of unusual percussion instruments in this work, familiar from horror and suspense movie scores, and the whole, immensely enjoyable work, has a tongue in cheek, Hammer film Gothic 'vibe'. Osmon has a taste for bitonality and octa-and pentatonic scales, especially evident in his humorous, snarky little suite and the energetic "and a dancer makes three", a most appealingly rhythmically vital tuba and marimba duet (an optional dancer onstage would indeed make three). Sosa's idiom is more straightforwardly tonal; his large piece "Energy" explores various types of - well, you know - with some thrillingly propulsive episodes of the mechanical kind, and radiant passages of the electromagnetic variety. Sprinklers is dancingly rhythmic, wittily playing with aural images of water in onomatopoeic percussion effects. Tennessee Tech Percussion Ensemble. Tennessee Tech Tuba Ensemble; R. Winston Morris, Marco Schirripa, Colin Hill (conductors).